The Department of Parks and Recreation will be closing the Old Airport Park in Kona from 7 a.m. on Wednesday, August 9 and Thursday, August 10, 2017, to facilitate community clean-up efforts. Anyone camping at or using the park is being asked to leave prior to and during the park closure and clean up. Under Hawai‘i County Code (Section 15-39), camping in the park will not be allowed after the park clean up. 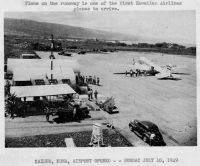 If you would like to volunteer or for more information please contact Charmaine Kamaka at 961-8561 or Charmaine.Kamaka@hawaiicounty…..
Kona Airport July 10, 1949. Archive Photo.